It is believed that Panama means an abundance of fish. Living up to its folkloric definition, it has long been a destination for fishing, especially big-game, sport fishing. Several world records have been set by fish caught of the shores of the Isthmus, including black marlin. Commercial fisheries have also steadily increased since the 1970s. Large tuna and billfish, including sailfish, swordfish, and marlin, are the main targets. A recent study by the Smithsonian Tropical Research Institute, cautiously estimated that almost 40% of fish caught go unreported. This alarming statistic could lead to the over-fishing and dwindling population of many of the species found in and around Panama. Pacific Black Marlin found on the Beach at Balboa. 1937. Gelatin silver print. 3.25 in. x 4.75 in. 2002.038.076.001 Panama Canal Museum Collection, George A. Smathers Libraries. Gift of Richard (Pat) Beall. 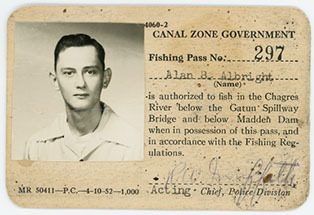 Fishing Pass No. 297 for Alan B. Albright. c. 1950s. 2003.030.037 Panama Canal Museum Collection, George A. Smathers Libraries. Gift of Brian and John Albright. The Canal Zone Forest Preserve: A Jewel of a Jungle. 2003.094.004 Panama Canal Museum Collection, George A. Smathers Libraries. Mola with Stingray and Fishermen. 20th century. Cotton factory cloth. 17 in. x 14 in. 2011.4.473 Panama Canal Museum Collection, George A. Smathers Libraries. Gift of Bertha B. Read. Fishing is an important part of daily life for Kuna men and scenes with hooks, nets, knives, and figures in canoes are a common motif. 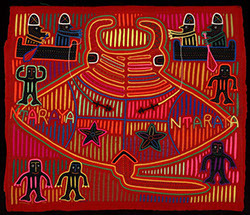 Symmetry is an important element to many mola designs, and it can be seen clearly in the markings on the stingray as well as the position of the boats and figures at the top of the panel. Mola with Amphibian Designs. Cotton factory cloth. 23.4 in. x 19 in. 2011.4.609 Panama Canal Museum Collection, George A. Smathers Libraries. Gift of Bertha B. Read. The apparently abstract, repeating, geometric pattern on this mola represents the body of a frog. 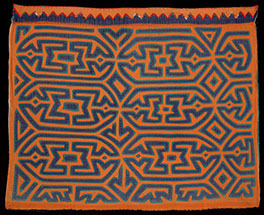 A common motif seen in newer and older molas.